Boot Camp allows you to dual-boot between a Windows partition and Mac OS X on a Mac. Dual booting multiple OS’s is incredibly useful and has plenty of purposes, but if you decide you no longer need to run Windows on a Mac you’ll probably want to remove the Windows Boot Camp partition so that you can recover the drive space. Some users wind up formatting the Mac drive and restoring from a Time Machine backup, but that’s not necessary, instead you can choose to remove only the Windows Boot Camp partition while preserving Mac OS X untouched. Before beginning, be sure to back up the Mac with Time Machine. This makes it easy to recover everything in the unusual event something goes wrong. It’s also important to remember that this not only removes the Windows installation, but also any files or apps that were stored on the Windows partition, so be sure to backup anything critical on the Windows side of things beforehand too. Done backing up? 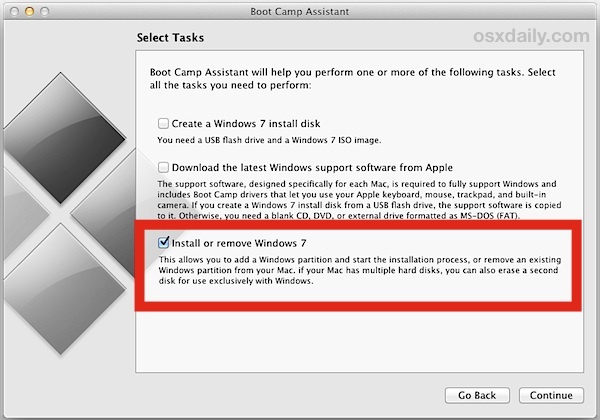 Great, here’s how to remove a Boot Camp partition of Windows 10, Windows 7, or Windows 8 while maintaining the original Mac OS X installation. Basically what this is doing is removing the Windows partition and repartitioning the Mac, similar to what you can do from Disk Utility. The major difference from going that route alone is that by going through Boot Camp Assistant, it also removes the Boot Camp utilities that aid Windows dual booting and the accompanying boot loader, providing for a cleaner removal process. If “Install or remove Windows 7 or later version” is greyed out and the check box can not be selected, you probably have already messed with the partition table or haven’t installed the latest Boot Camp drivers. If that is the case, simply resize the boot volume to accommodate the available space, or remove the remaining unnecessary partition from the Disk Utility apps Partitions panel. Hi. You said something at the end saying: “If ‘Install or remove Windows 7 or later version’ is greyed out and the check box can not be selected, you probably have already messed with the partition table or haven’t installed the latest Boot Camp drivers.” I tried removing Windows via Bootcamp Assistant after something went wrong in the installation process, but midway the deletion of windows something just cancelled it completely (don’t remember what it said) and now i can’t delete Windows or finish the Windows setup because the USB where it’s supposed to say “BOOTCAMP” doesn’t say it anymore and it says “This drive can’t be formatted because it of GTS (or something like that) format”. Disk utility isn’t helping either because i can’t find the bloody Windows partition (more specifically, it ain’t there, mate). Care to shed some light into it and help me out please? Cheers mate. Go through disk utility and verify and repair each disk and then restart. I’ve deleted windows with both bootcamp and disk utility and restored space, but after that windows remains in startup screen(when you open computer with alt pressed). A big thank you for this easy to follow guide. After reinstalling windows 10 due to a need for some repairs, the bootcamp assistant is no longer available. I assume the windows reinstall wiped it out. Can I reinstall the bootcamp assistants software to the windows 10 system without wiping it out after it is already up and running. I would like to see it in the system tray again and have access to controlling the mouse and keyboard again.